Do you think there will be a Part 3 of the hit Angel Locsin fantasy TV series "Lobo"?! Well, rumors spread like wild fire in the internet because of the picture above! As you can see, two characters of Angel Locsin are showcase. One is named Lia while the other one one is Larentia. It seems that there will be two opposing characters of Angel to come, one is the good Lia while the other is a bad Larentia. And the characteristics of these two characters are even supported by a white and a black wolves beside them! Do you think there is a continuation of "Imortal" which is also called "Lobo 2" as the picture above connoted?! If that's the case, Lia (or Lia the second) and Larentia will be the twin daughters of Mateo and Lia. 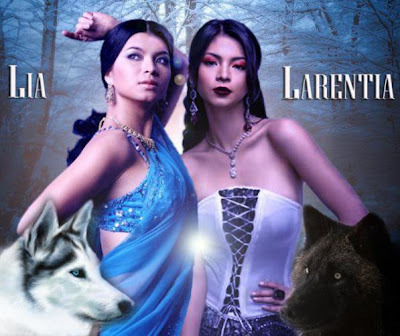 Angel both portrayed the lead characters of Lyka and Lia in "Lobo 1" and "Lobo 2" so definitely, she is also the main character in the third part! This is exciting news!!! Can't wait for this one!